MOBILE OPERATED ROBOT: The robot is made for the purpose military operation, spy robot or navigator in forest.The mobile operated robot is a very small application of DTMF technology we showing you how we can use the DTMF to operate a robot because the robot is operated by a mobile so the range of the robot communication is not limited its just depends on the network of the mobile and in present senario the mobile network is everywhere. DTMF: DTMF(Dual Tone Multi-Frequency) , better known as touch-tone is a system of signal tones in telecommunications.This technology is used in several of Applications for example voice mail, customer care,telephone banking etc. There are twelve DTMF signals, each of which is made up of two tones from the following selection. ROW'S- 697 Hz ,770 Hz ,852 Hz, 941 Hz. COLUMN'S- 1209 Hz, 1336 Hz, 1447 Hz , 1633 Hz. The tones are divided into two groups (low and high) , and each DTMF signal uses one of tone from each group. This prevents any harmonics from being misinterpreted as part of the signal. 1. 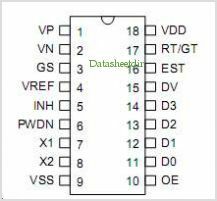 Pin 15(DV data valid): The data valid pin is become high when the dtmf decoder receive a valid data or this pin hold's the 5v when the key is pressed. 2. Pin 10(OE output enable): This pin is use to enable the output when this pin is high the data pin are active and the decoded output is sent to the decoded pin. 3. 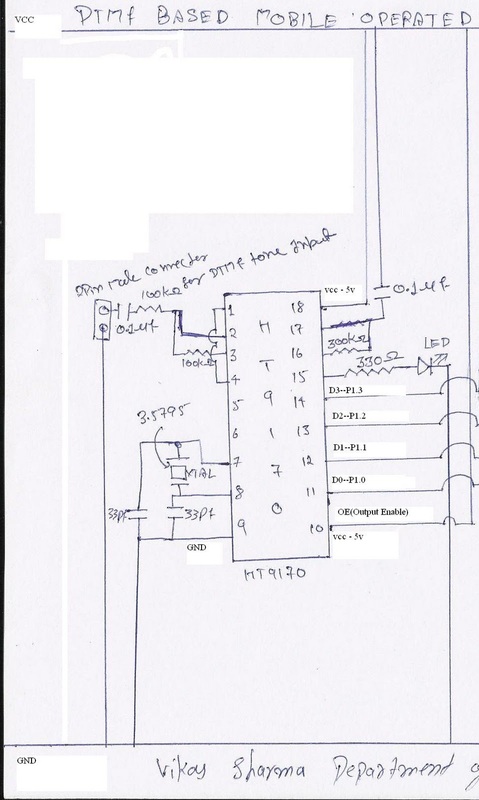 Pin 11-14(D0-D3 data pins): These are the data pins which makes the 4 bit data after pressing a key on the mobile such as 0001 for pressing the key 1 and other are shown into the picture shown. 4. Motor driver circuit: The IC-l293d is well known as motor driver this is 12v motor driver we use the motor driver IC because our micro-controller is work on 5v and the motor have different operating voltage. 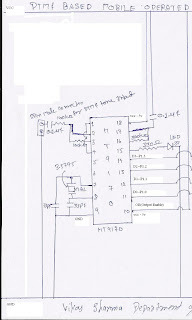 So to meet with these parameter we use these driver IC there are so many other IC available for different configuration. 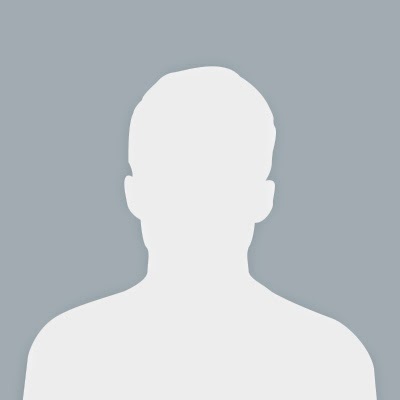 Sir Can you tell me how exactly have you connected the ear phone to the dtmf decoder input ? 1)short, simple and superb theory! 2)clear and self explanatory ckt diagrams. 3)necessary links are provided for required datasheets. 4)even a starter without having much knowledge of robotics can make his project. 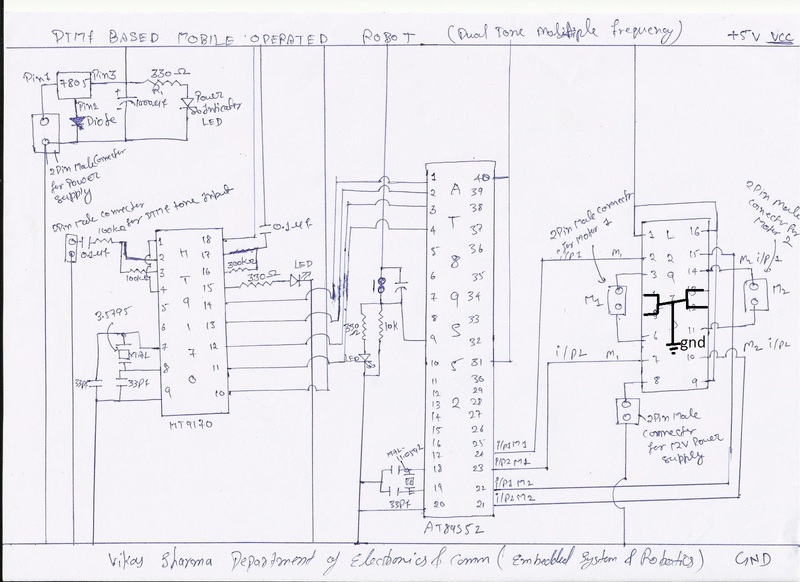 sir,could you please tell me how to connect ear phone to the dtmf decoder input/What is A Jack and what does it do? 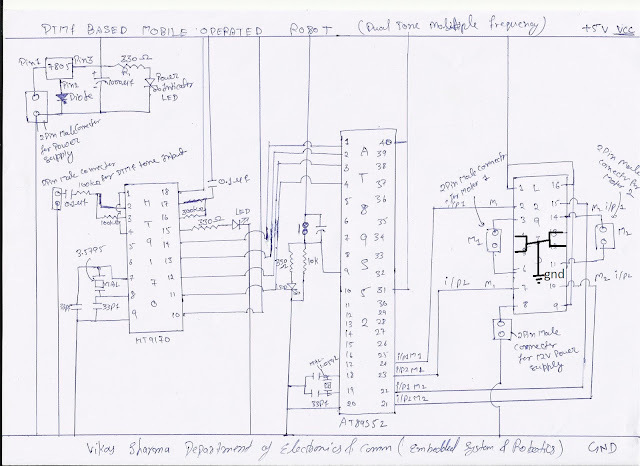 sir i want to know how many voltage is given by the 9170 ic at output pins.